The Evora has been heavily revised since we last ran one on our fleet in 2012. Have the changes made it a better prospect to live with? The first time I hear the Lotus Evora that we will be running for the next few months, a few of us are at the Longcross test track. Despite the fact that this is next to the M3 motorway, where some really quite noisy roadworks are in progress, we hear the Lotus before we see it. A long time before we see it, in fact, as its revs hit their 7000rpm peak several times before some heavily brapped downshifts accompany its hoving into view. First impressions? Crikey, it’s loud. Crikey, it’s yellow. Crikey, it’s an auto, which, no offence to its driver, explains the enthusiastic throttle blipping it made on final approach. 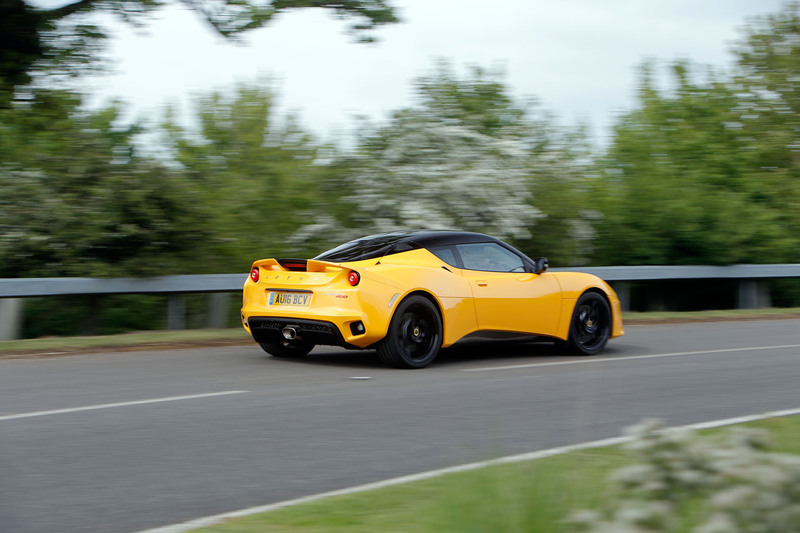 The £72,000 Lotus Evora 400 made its debut last year. To call it a facelift would be harsh; to call it a new car would be misleading. By Lotus standards, lots has changed from the model that first appeared in 2009. By most car makers’ standards, it has been given a few tweaks here and there. The Evora basics are as they were. It has a bonded and fastened aluminium chassis, to which a plastic body is attached. There’s a long cabin by midengined car standards, accommodating the driver and passenger, a pair of diddy seats behind them and, at the back, a supercharged 3.5-litre Toyota V6, which drives the rear wheels through a sixspeed automatic gearbox (a six-speed manual is standard). Power is — the clue is in the name — 400bhp and torque is 302lb ft at a modest 3500rpm. That’s sufficient that, if you spec the manual ’box, you get a limited-slip diff, but it’s an option denied those who go for the torque-converter auto. There’s also a shallow but wide boot. And, no question, it’s yellow — a colour that’s a no-cost option, unlike some of the contrasting black features that have made it onto this Evora. Black leather trim (£2500), black brake calipers (£300), forged black wheels (£2000) and a Black Pack (£1500) are all fitted. They join the auto ’box (£2000) and cruise control (£300) in adding £8600 to the Evora’s base price, taking the total for this car to £80,600. Yep. This is an £80,000 Lotus. That’s quite the ask for a plasticbodied, Norfolk-built sports car, is it not? Albeit one that comes with a respectable set of statistics: 0-60mph in 4.1sec and a top speed of 174mph. Weight is a claimed 1425kg — 30kg more than the manual. The Evora always occupied a place between Porsches Cayman and 911. At £80,000, though, it’s pushing firmly into 911 territory. What does that get you? 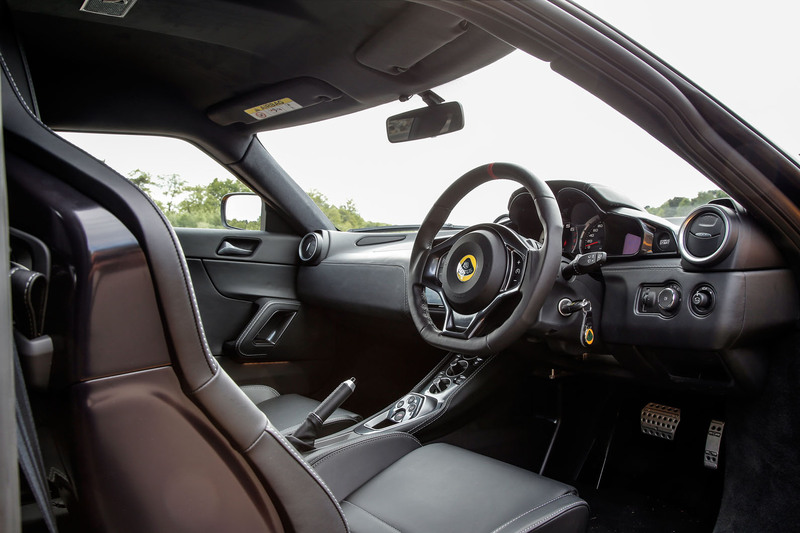 When it comes to cabin niceties, it’s very, er, Lotus. There are no cupholders, there’s air-con but not climate control and the infotainment is the fiddliest Alpine aftermarket head unit you’ll have used in years. But the basics are good: the driving position is straight enough, the seats are supportive and the steering wheel is small and pleasing to hold, with tidy shift paddles attached to the back. Cruise control takes centre stage on the wheel; a volume control doesn’t get a look in. Column stalks are items Ford no longer uses. The light switch is one Vauxhall still does. Other switches are bespoke to the car. Materials and their finish are more bespoke than in anything German of the same price, which is kinda good and kinda not, depending on where you look and how you feel at the time. As a ride and handling enthusiast, I don’t care a jot. As a Costa enthusiast, I do. Lotus will tell you this is a sports car, so get your priorities straight: steering over coffee. Fair enough. Most owners would have another car for everyday use, after all. Likewise I’m still running an SUV, but the truth is I end up in one car for days at a time, which means I might well have the Lotus when there are 300 motorway miles to do before breakfast or some colleagues need a lift to the cafe. This Evora, then, is being asked to do jobs a 911 would manage with ease. And, to give it its due, it’s not bad at them. The boot is more practical than a 911’s, albeit considerably warmer at the end of a long journey. The rear seat is usable, long-distance comfort is good (although the Sparco driver’s seat has already developed a creak), the engine note is steady in normal mode and heady if you flick the exhaust button or take the car into Sport or Race modes, and the ride is compliant, because although the wheels are 19in front and 20in rear, the car was developed for those sizes. You can spec different wheels but not different sizes. Which is, again, a very Lotus way of doing things. Then, of course, it does the things Lotuses do best. It rides, it steers and it handles, although it’s perhaps less free from corruption than earlier Evoras and has less all-round compliance, but it’s still leagues ahead of most sports cars. It has a keenness to match, steering brilliantly and with great throttle response, and the chassis is agile and communicative even at sensible speeds. The auto is good enough if you shift yourself and the zingy ’zorst tops it off. It’s so engaging, in fact, that, on a late journey back from work, it makes you want to drive straight past home and carry on to some brilliant roads. So far I’ve had that opportunity twice and taken it twice. I’m not sure many other cars — whatever the badge, wherever they’re from, or whatever the price — would have done that. I’m looking forward to seeing how long that lasts. It actually has four cup holders, two in front and two in rear. That's one for each seat. How 'long term' did you actually have this car?